Victor David Hanson, author of the highly regarded classic The Western Way of War, presents an audacious and controversial theory of what contributes to the success of military campaigns. Examining in riveting detail the campaigns of three brilliant generals who led largely untrained forces to victory over tyrannical enemies, Hanson shows how the moral confidence with which these generals imbued their troops may have been as significant as any military strategy they utilized. Theban general Epaminondas marched an army of farmers two hundred miles to defeat their Spartan overlords and forever change the complexion of Ancient Greece. William Tecumseh Sherman led his motley army across the South, ravaging the landscape and demoralizing the citizens in the defense of right. And George S. Patton commanded the recently formed Third Army against the German forces in the West, nearly completing the task before his superiors called a halt. 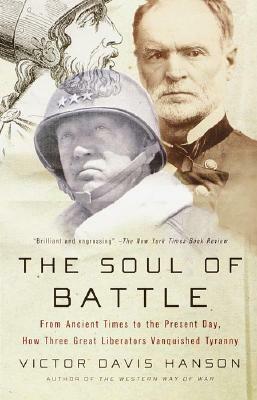 Intelligent and dramatic, The Soul of Battle is narrative history at it’s best and a work of great moral conviction. Victor Davis Hanson is the Martin and Illie Anderson Senior Fellow in Residence in Classics and Military History at the Hoover Institution, Stanford University, a professor of Classics Emeritus at California State University, Fresno, and a nationally syndicated columnist for Tribune Media Services. He is also the Wayne & Marcia Buske Distinguished Fellow in History, Hillsdale College, where he teaches each fall semester courses in military history and classical culture. He is the author of Carnage and Culture, An Autumn of War, and Ripples of Battle, all published by Anchor Books. His most recent book is The Savior Generals (Bloomsbury 2013). Hanson was awarded the National Humanities Medal in 2007, the Bradley Prize in 2008, as well as the William F. Buckley Prize (2015), the Claremont Institute’s Statesmanship Award (2006), and the Eric Breindel Award for opinion journalism (2002). He divides his time between his farm in Selma, CA, where he was born in 1953, and the Stanford campus.